The Law Office of Richard Vaznaugh has created this privacy notice to explain how we use information that you may provide while visiting our website and to demonstrate our firm commitment to Internet privacy. The Law Office of Richard Vaznaugh may modify this policy from time to time, so we encourage you to check this page when revisiting this website. When you visit The Law Office of Richard Vaznaugh website, we automatically obtain information from you about the name of your Internet service provider, the browser and type of computer you are using, the website that referred you to us, the pages you request and the date and time of those requests. We use this information on an aggregate basis to generate statistics and measure site activity to improve the usefulness of the site to our visitors. For example, we use this information to track which pages are most popular among visitors. We do not track the pages you or any individual visitor may look at during a visit to our site and we do not collect any other information without your knowledge and permission. We do not collect or store personally identifiable information, such as your name, mailing address, e-mail address or phone number, unless you provide that information. 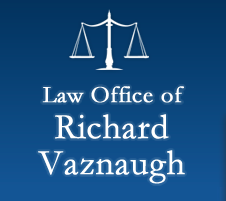 The Law Office of Richard Vaznaugh provides Web forms so you may provide your contact information to correspond with The Law Office of Richard Vaznaugh, or request our firm to assist you in evaluating a potential lawsuit you may have. Any information we collect, such as your name, mailing address, e-mail address, type of request you are making and any additional information you provide, is collected and stored by The Law Office of Richard Vaznaugh. The information is used to fulfill your request and track aggregate information about usage of these features. The Law Office of Richard Vaznaugh website will not post your personal contact information, including e-mail address, street address and phone numbers, on the website without your consent. Communication through our Web form is not intended to create an attorney-client relationship between you and The Law Office of Richard Vaznaugh. If you communicate with us in connection with a matter for which we do not already represent you, your communication may not be treated as privileged or confidential. This site contains hypertext links to other sites. The Law Office of Richard Vaznaugh is not responsible for the privacy practices or the content of such websites. We encourage our users to be aware when they leave our site, and to read the privacy statements of each and every website that collects personally identifiable information. This privacy statement applies solely to information collected by this website. The Law Office of Richard Vaznaugh makes every effort to ensure the secure collection and transmission of your sensitive information. However, please be advised, should you choose to communicate with us via e-mail or Web form, that (1) e-mail communication is not a secure method of communication, (2) any e-mail that is sent to you or by you may be copied and held by various computers it passes through as it goes from us to you or vice versa, (3) persons not participating in our communication may intercept our communications by improperly accessing your computer or my computer or some computer unconnected to either of us which this e-mail passed through.